Karen and I have had the luxury of being on our boat at many marinas. In addition to this, ActiveCaptain has put us in contact with tens-of-thousands of marinas, yacht clubs, and marine facilities. There are different types of marinas just like there are different types of resorts. All have their advantages and disadvantages. But what matters the most, we've found, is how true a marina is to their own goals and customers, and how well they are able to use their own advantages to make a boater's stay better. If that is the measure of success, Olverson's is at the top of the heap. Freddie Olverson's father bought a mile of waterfront property just after World War II. Together they built a marina themselves in Lottsburg, Virginia. It is a very rural place with farmland surrounding the area. There isn't a lot to do in the immediate area. Heck, there isn't a lot to do in a 5 mile radius. Don't come here looking to sign up for a pilates class or expect to make an appointment for a massage with cucumbers cut and applied to your eyelids. That isn't going to happen here. But what the Olverson's have built is the perfect thing in so many ways for the transient boater - a welcoming place, clean facilities, access to whatever you need, and community. It is so rare to find a full-service grocery store near a marina. The same is true of a hardware store or almost any type of store. And none of those things are around here either. But at Olverson's, there are three courtesy cars ready for the needs of boaters. This means that "walking distance" doesn't matter. We have wheels here. So on the first day we ran the kids around the field and while they slept, we ran off to a real, full-size grocery store. It was 6 miles away - nothing we could ever walk to. On the trip home we noticed an ACE Hardware store so we went back today - there's a water shutoff I want to add to one of the water lines and they have everything I need for $20 there. We also stopped at a Dollar Store because Karen had a bunch of things that we didn't need but had to have. 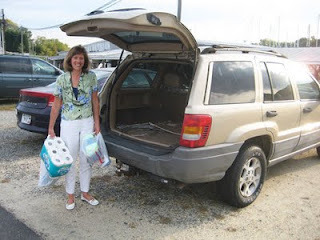 The car we used is a Jeep Cherokee. It isn't fancy and the Air Bag light stays on and beeps at you every 5 minutes. But it ran well and carried everything we needed. And if we want to go to the Italian restaurant that Freddie told us about this afternoon, the keys are in the car right now and we can just go. When we pulled into the dock on Monday there were at least 5 people there waiting to assist with our lines. Trust me, you don't get that at a "top rated" marina. I wish I had taken a picture of it. There's a spirit around this place of being home. Freddie and the Olverson family have done an exceptional job of making the community of boaters and transients here feel welcome. That's no easy job. Sure, we'll stay at fancier places but I doubt we'll stay at a place that cares more. When driving north on I95 and entering the state of Maine, there's a famous sign that greets you. It says, "Welcome to Maine, The Way Life Should Be." Welcome to Olverson's - the way a marina should be. A fellow might just want to stop there even if he planned to anchor out! Is everybody getting grits a good thing, or a bad thing? It would be bad for me, I hate gtits, and I’m a southerner. I haven’t been paying attention - How’s the weather looking for a offshore run to Charleston? Still in the cards? Too early to know? Too many questions? Nice report on the marina. I’ll stop there on our trip north and I’ll say “Active Captain” sent me this way! Everyone had smiles this morning with the grits so I think it was a good thing! We're definitely going offshore between Beaufort, NC and Charleston. We'll wait if necessary for good weather. If the weather is nice when we're near Norfolk, we'd like to try an overnight around Cape Hatteras to Beaufort. If the weather doesn't look good or there's an issue leaving early for hurricane/insurance reasons, we'll take the ICW and wait in Belhaven. Olverson's is worth the stay for a few days or longer. MTOA members get their first night free - I didn't even mention that although it is in the ActiveCaptain record. 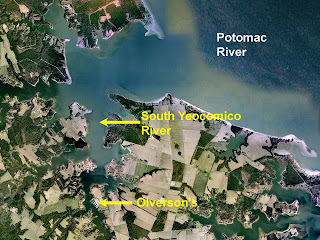 We just dropped the hook in Smith Creek and I see we are just across the Potomac from where you guys are (assuming you are still there). We'll be heading south early to get to Norfolk area tomorrow Thur) and then on to Great Bridge. We too will wait for weather to jump offshore at Beaufort, NC. Would like to head further south than Charleston if possible. Depends on weather. PS We also had grits this week. It is too cold for us Floridians!